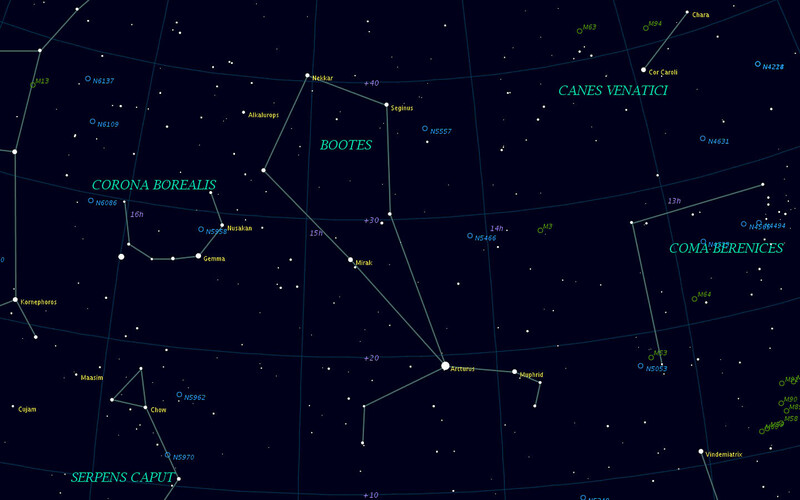 Boötes is a dominant Spring constellation featuring the bright star Arcturus. While the constellation represents a hunter or herdsman, the asterism resembles more a kite flapping away in the Spring breezes. Boötes is celebrated as having some of the loveliest binaries in all the heavens. Alpha Boötis is better known by its name Arcturus, which is a variant of its Greek name meaning the Guardian of the Bear (that is, the Great Bear of the North -- Ursa Major). In fact in Greek ‘bear’ and ‘arctic’ are similar: arktoV (arktos) and arktikoV (arktikos). Arcturus is a golden giant, about twenty times the size of the Sun. It's also a binary. With its companion it has a combined visual magnitude of -0.05, making it the fourth brightest in the skies. It's most convenient to begin studying the constellation right here at Arcturus. An arrow-shaped asterism at its west, just out of the FOV with Arcturus, forms the left foot of Boötes the Hunter. Beta Boötis is ‘Nikkar’ The Herdsman. This yellow giant forms the top of the kite (or head of the Hunter if you wish). From mu Boötis move to the northwest a little over one FOV. Due north eight degrees is the popular binary known as Struve 1909 (or 44 Boötis). This eccentric and rapidly moving binary is currently quite accessible for medium to large telescopes, with a position angle of 54º and a separation of 2.2". With a combined visual magnitude of 4.8, it's the brightest star in a group of three. Back at beta Boo, due east--just barely in the same FOV -- is the pleasant binocular pair nu1 (white) and nu2 (orange). These two are unrelated, they don't form a true binary, but nevertheless make an attractive pair. Epsilon Boötis is a very fine double with contrasting colours, a yellow primary and blue-green companion (2.7, 4.9). The position angle is 339º and separation 2.8". Epsilon is the second brightest star in the constellation, and is easily found with the naked eye, northeast of Arcturus and forming the apex of a gentle triangle along with Arcturus and Alphecca (alpha Coronae Borealis), to the east. Kappa Boötis is yet another very attractive binary with colour contrast, a yellow primary [kappa2 (4.5)] and deep blue companion [kappa1 (6.6)]. The companion is fixed at a position angle of 235º and separation 13.4". Kappa is easily found by starting at the tip of the handle of the Big Dipper (eta UMa). With this star at the southwestern edge of your glasses, kappa is northeast. Iota Boötis is in the same FOV, southwest of kappa. Iota is an easy binocular double -- visual magnitudes 4.8 and 7.5, a position angle of 33º and separation of 38.5". Mu Boötis is a wonderful triple system. Binoculars show the first companion (7.1) but you'll need a medium sized telescope to reveal that this companion also has its own companion (7.7 mag) with a 246 year orbit. The 2000 PA is 7º and the separation (2.1") is near its maximum. Mu Boo is found by moving up the eastern edge of the kite-shaped asterism eleven degrees northwest of epsilon. In the same field is delta. You'll note that beta Boötis is in the same region, just out of view to the northwest.